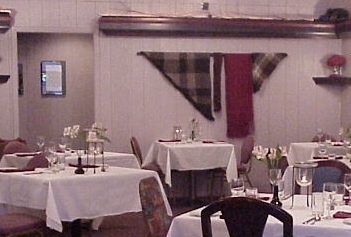 This display was last shown on May 27, 2000. An exhibit featuring the work of the Fair City Spinners members: Anne Bosch, Rhoda Braunschweig, Hazel Carter, Ruth Cadoret, Linda Charlton, Margaret Cottam, Kerrye Dixon, Jane Grogan, Jean Jensen, Siobhan Keenan, Joyce Lesar, Michelle Martin, Ursula Peterson and Phyllis Turner, who in this exhibit answer the question of . . .
because I like the feel of the fibers. . . beautiful yarn can emerge. . .
make more texture and use more fiber blends. . .it is so relaxing. . . fun to see the yarn form from the fibers. . .love the colors. . .
productive and calming. . .a feeling of serenity. . .to see the yarn grow before myeyes. . .want to experiment with another type of fiber. . .it's an endless cycle. I love it. The basis of spinning is the twisting of fibers (raw material) while they are being drawn past one another. The resulting yarn design is determined by how this drawing out and twisting is done, and the relative positions of the fibers. The fibers may lie parallel to each other to give a smooth yarn, or more jumbled to produce a soft springy yarn. The fibers may be drawn past each other very regularly for an even yarn, or with planned irregularity like a slub yarn. Yarns may be thick or they may be thin. The amount of twist can be considerable, or very little. Yarns that have been spun can be spun again to make plied yarns of many kinds. Whatever the design of the yarn, it involves arranging the fibers (carding or combing), drawing out the fibers and twisting the fibers, and winding the resulting yarn onto a drop spindle or spinning wheel bobbin. The exhibit includes drop spindles and spinning wheels. 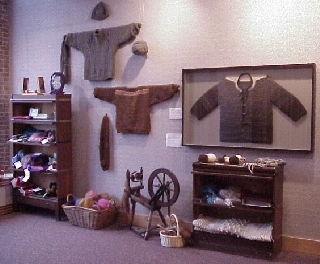 Some of the yarns in the exhibit are the natural color of the fiber as it came from the sheep, silkworm cocoon, llama, musk ox, or other source. Others were dyed either as fiber or as yarn. Gray handspun and handknit WOOL SWEATER AND HAT, natural color of the sheep, shown with its ROVING (prepared fibers) and YARN. The wool of the BROWN HANDSPUN SWEATER has been dyed with walnut, madder and marigold; it is shown with the CLEANED FIBER, DRUM-CARDED BATT and HANDSPUN YARN. The permanently installed framed exhibit is a PROTOTYPE of the EPAULET SWEATER designed by internationally renown Elizabeth Zimmermann (1910-1999). Elizabeth Zimmermann and Carolyn Smith (Vashon Island, WA) spun the naturally colored wool fiber into yarn which Elizabeth knit into this seamless sweater. The exquisite LACE SHAWL was handknit from a tencel-merino blend that was handspun. A small sample of the UNSPUN FIBER is shown. 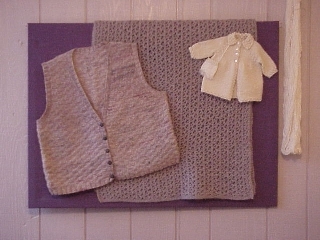 The knitting pattern is Medeira, using 4 ounces of fiber (725 yards of yarn). The NAVAJO RUG was handwoven from handspun wool. The browns and gray were the natural color of the sheep; the red was dyed as fiber and blended for spinning. The SINGLE PLY YARNS are shown, as well as WASHED FIBER of one of the browns. The DOWEL OF SKEINS OF YARN shows examples of some of the more unusual fibers/blends. -2 different yarns made from a silk-qiviuq (down of the musk ox) blend, 2 ply. Fiber from the first shearing of the llama, Miss Ginger (pictured), is shown with its handspun yarn. 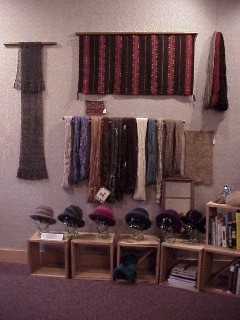 HATS and PURSES (for sale) are handknit from a combination of handspun and millspun yarns made from sheep raised by the spinner. All sheep are named - Connie, Jeremy, Louise, Pierre, Ernestine are examples. Sometime spinners return year after year to buy the fleece of a particular sheep whose wool they particularly like. These hats and purses are knit and then fulled to give them their final appearance. Notice the hat that is knit but not fulled (below the finished hats). Wool fibers handspun and handwoven on a triangle loom, with a large TRIANGLE SHAWL and a smaller SQUARE SHAWL. The RED SCARF was handwoven from handspun wool, 2 ply - the skein shown was used as a warp yarn. HANDKNIT PURSES made from a combination of handspun and millspun yarns, then fulled. Shown with a variety of handspun yarns. VEST handknit from handspun mohair-wool. 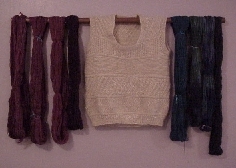 Shown with SKEINS OF HANDSPUN YARNS. GANSEY VEST handknit from homespun yarns. Shown with skeins of HANDSPUN YARNS. DOLL COAT handknit from handspun yarn (shown). This yarn is a 2-ply yarn, with one ply being handspun and the second ply a commercial sparkle yarn. AFGHAN handknit from handspun yarns made from blended colors, including magenta, turquoise and navy. The wool is from spinner's own sheep, mostly lincoln. VEST handknit from handspun yarn. East wall in dining room - toward back. TWO DOLLS entitled The War of the Sexes handknit in handspun yarn. Handwoven NAVAJO RUG shown with its handspun single ply yarn made from Churro sheep (a traditional sheep raised for these rugs). SWEATER out of a spinner's first spinning. First attempts usually result in lumpy yarn and can be used in attractive ways. Please note the variety of items used in or created out of the fiber to yarn process.